1. 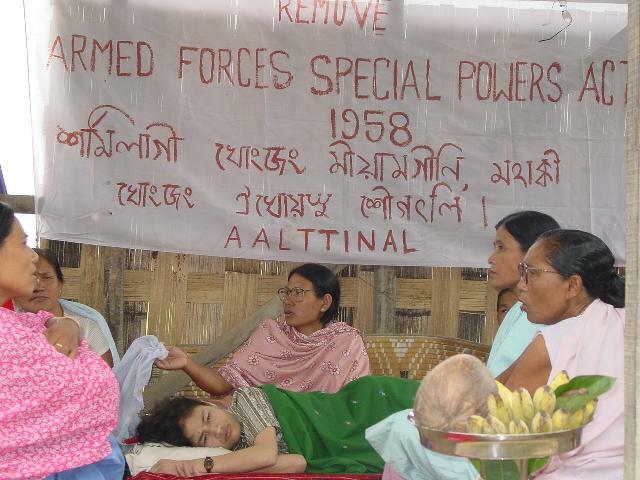 A draconian law: The AFSPA is a piece of colonial legislation that gives the armed forces of India unfettered power: (i) to use lethal force on civilians even to the extent of causing death on mere suspicion that they may cause breach of any law or order, (ii) to search any dwelling places by breaking them on mere suspicion without warrant and (ii) to arrest people without warrant and to keep them in custody for unspecified time and more importantly the Act also bars the judiciary to question any acts of the armed forces operating under the Act in areas declared disturbed under the Act. 2. Its continuance is based on lies: The Government of India took the plea that it is a temporary measure for meeting an extra-ordinary situation and it would be withdrawn as soon as possible. This plea was taken in parliament when the Act was being passed, in the Supreme Court in the Naga People s Human Rights Movement case in 1997 and in international forums including the United Nations Human Rights Committee. It is now 53 years in North East and 21 years in J & K. If a measure for this length of time is temporary than what is permanent? 3. The provisions of the Act militate against the purpose of its enactment: The non-state armed groups (insurgents, extremists or terrorists, whatever you may call them) need to be dealt with and contained because they violate rights of the people to live peacefully, they try to impose their will on the people and the state unlawfully and violently trampling the constitutionalism and the rule of law that are sine qua non for civilised human existence. It is the mandate of the state to maintain the reign of law and constitution and the writ of the government established by law along with ensuring security and safety of the person and property of the citizens. But when the state through its security forces and law enforcement agencies commits more atrocious acts than the acts which it professes it is fighting the difference between the non-state terrorists and the state gets blurred.The armed forces of India when operate under the AFSPA do not act for enforcement of the constitution and the law of the land or for protection of the life and property of the citizens. Because, they operate outside the constitutional and legal system of the land. The AFSPA places them above the constitution, law and human rights obligations. The AFSPA gives them the power to commit atrocities and wreak terror on the citizens which they are supposed to combat and prevent and protect the citizens from, with additional guarantee of immunity from any accountability. The mischief that is addressed in the statute is doubled by its provisions. To purportedly prevent the people from the terror of certain armed groups the sate itself has unleashed its unmatched terror upon the very people under the AFSPA. And it is not only in law but very much in practice. 4. Problematic political premises: The political premise of the Act appears to be very problematic in the sense that it seeks in essence to impose “Indian-ness” through violence on some of the people of the country who are deemed not to be adequately “Indian”. This is apparent from the facts that despite naxalism being claimed as the biggest threat to the national security the Act is not extended to the naxal affected central India. Rather, it is stated that the responsibility to deal with such problems rests with the state governments, which is very true. This discriminatory attitude can not be explained in any way other than the racial reading of the situations and believe in fascist violence. The “Indian-ness” as it was understood by our freedom fighters and for which they embraced martyrdom is not one which would needed to be or which could be imposed through violence. However, it should be more than clear that we are not seeking extension of the AFSPA to any other part of the country since we want total repeal of the Act. There are many draconian pieces of legislation in force in naxal affected areas, though not of the nature of AFSPA, such the Chhattishgarh Public Security Act etc. which are also needed to be repealed. The phenomenon called naxalism has arisen largely due to the deprivation, discrimination and exploitation of the tribal people of the area. These problems need to be addressed politically and through peaceful means. 5. A fraud on the constitution: The Act provides more than emergency powers to the armed forces fraudulently bypassing the provisions of the constitution of parliamentary oversight over the exercise of such powers. The constitution also imposes duties upon the Union Government to perform its obligations under the international treatises. India is a party to the International Covenant on Civil and Political Rights, 1966 (ICCPR) which provides for derogations of some the rights in times of emergency declared legally, which are nonetheless derogated by the Act without such declaration. It is to be noted that the Supreme Court did not examine the compatibility of the Act with the international human rights laws in the Naga People s Movement for Human Rights. 6. The law lacks legality: Both the procedural and substantial requirements of legality are conspicuous by their absence in this Act of the parliament. On the procedural level it is to be noted that the Act came not only as a product of a “decision” by the political executive (i.e., as an ordinance on 22nd May, 1958) but also subsequently escaped more or less unscathed from the “legislative oversight function” of a democratically constituted Parliament on 18 August, 1958. And finally, rather than returning the legislation to the Parliament again for reconsideration, the President readily gave his assent on the legislation, thus making it into a law on 11 September, 1958. On the substantial level the Act does not pass the test of precise definition as its terms are too vague and it also provides powers/measures disproportionate to the mischief it is intended to address. 7. Arbitrary application: Not only the framing of the Act and its provisions are arbitrary but also the application of the Act by declaring certain areas as disturbed is also arbitrary inasmuch as the declaration of areas which are not disturbed in the sense in which the term is contemplated in the Act. For example, the southern part of Assam comprising of the districts of Cachar, Karimganj and Hailakandi that is known as Barak valley is declared as disturbed area under the Act which can not be said disturbed in any meaning of the word. There has never been any insurgency in the area. And the former Prime Minister Indira Gandhi proudly declared it as Valley of Peace admitting the fact. 8. Recommendations of the government committees: Every government committee which examined the Act opined against its continuity in the present form including the Administrative Reforms Committee headed by Mr. Birappa Moily. Most importantly, the Committee to Review the Armed Forces (Special Powers) Act, 1958 chaired by Justice Jeevan Reddy unambiguously recommended total repeal of the Act. 9. Militarisation of democracy: The ethos and practices inaugurated, nurtured and sustained by the Act has led to critical erosion of normative (norms) and institutional mechanisms of a civilized democratic life which are critically manifest as (a) the near collapse of Criminal Justice System and (b) culture of impunity of unbridled violence in peoples life. The mockery of democracy is such that it can be termed as democracy at gun point. 10. Traumatised society: Actions taken under the Act caused hundreds of extra-judicial killings, rapes, torture, enforced disappearances forcing the people to live an uncertain terror-striken life bereft of human dignity. It has made the whole society mentally sick and traumatized.And on many other reasons. The author is an advocate at Gauhati High Court and human rights defender with Barak Human Rights Protection Committee. This entry was posted on February 6, 2015 at 1:22 pm and is filed under Advocacy, Article, Resources. You can follow any responses to this entry through the RSS 2.0 feed. Both comments and pings are currently closed.